Our staff writers recommend CDs by Kimbra, Tyrese and Dev. Our staff writers love Sixteen Candles, Better Off Dead and Do the Right Thing. These are letters we received about stories that appeared in the September 2012 issue of L.A. Youth. Members of our teen staff couldn’t agree on whether teens are mature enough to have a vote. Confused by the language of the candidates and media? Emily did some research to figure out what words like “filibuster,” “liberatrian,” and “conservative” actually mean. 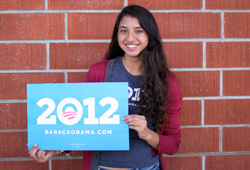 Even though she can't vote, 17-year-old Avika cares about issues like jobs and college costs. Though I was excited to wear my Obama shirt and talk to classmates about something more important than crushes or the school play, I couldn’t vote and the issues I cared about didn’t directly affect me. It wasn’t until my dad lost his job a month before the election that I felt touched by one of its central issues—the economy. Yesenia, 18, worked hard in school because her immigrant parents wanted her to have opportunities they never had. Even though 16-year-old Katie’s older brother can’t talk or walk, they’re still there for each other. After Daisy, 17, read a poem by Sylvia Plath, she became her literary idol. With Nash and Howard on the team, Cliff, 14, thinks the Lakers will be champs again. Hanifati, 18, wants people to know that Islam is a peaceful faith. These Los Angeles teens were thrilled when Barack Obama won re-election against Republican Mitt Romney and they share their hopes for his second term. These teens say they wish security was better so they could use them more. When does like become love? Find out where the candidates stand on the issues you care about. Melissa, 16, wasn't sure if she was a Republican or a Democrat.